This golden spice, used in almost every meal in India is very valuable. "It is a very powerful healer. It prevents growth of cancer cells and thus can prevent cancer,"says Mumbai-based nutritionist Naini Setalvad. Its anti-inflammato ry properties reduces swelling caused due to pain. "It also said to prevent alzhiemers and said to reduce severity of pain caused due to arthritis,"says Mumbai-based nutritionist Maithili Pashtekar. This spice also acts as an antioxidant that helps lower cholesterol. Often used in coffees and other desserts, cinnamon is said to have the ability to reduce blood sugar levels. "This spice contains antioxidants that help lowering levels of bad cholesterol,"says Naini. More good news for women- including this spice in your diet will also ensure less painful cycles. Good ol'ginger candy has always been an instant cure to motion sickness or has curbed a feeling of nausea. The spice does more than that. "It improves your digestive process and prevents stomach disorders like flatulence,"says Naini. It is also said to regularize blood flow, thus maintaining your blood pressure. Holy basil or tulsi is said to be a great de-stressor as it"reduces levels of serotonin,"Maithili says. Try a tea made of basil leaves and ginger for relief from indigestion, headaches and fever. Chewing on leaves of basil could also reduce symptoms of bronchitis and asthma. This condiment lowers your chances of getting cancer. Other than that, according to Naini,"it helps in lowering bad cholesterol and keeping your blood pressure in control. 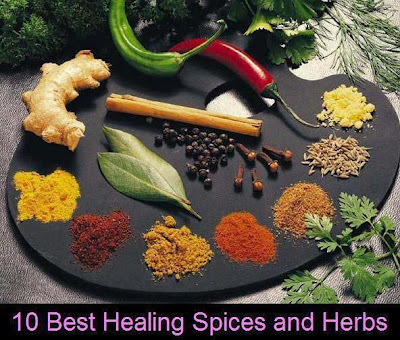 "It also has anti viral properties and helps in clearing your sinuses. "It helps to digest iron and protein,"says Maithili. Garlic is also a powerful antioxidant that protects your body against damage from free radicals. Cumin powder in water with salt and lemon is probably the best way to curb a diarrhoea attack. "It also acts as a blood purifier and is an excellent remedy for stomach cramps,"says Naini. Due to its cooling properties, it is added to most drinks and juices during summer. Mustard seeds is said to curb the growth of cancer cells. "it also has anti inflammatory properties and is said to restore normal sleeping patterns in women with symptoms of menopause,"says Maithili. It also reduces severity of asthma and lowers high blood pressure. Saffron is a powerful antioxidant too. "It is said to be an anti-depressant and can cure bladder, liver and kidney disorders,"says Naini. A li'l saffron in your tea can relieve you of a cold too. Saffron also has antiseptic and anti inflammatory properties. Rubbing saffron on sore gums can provides relief. Known as elaichi, this spice is also effective in curing stomach cramps. It is also said to cure other stomach disorders like flatulence and acidity. "It also improves your circulation to your lungs, Maithili says. Boil water and add mint leaves and cardamom to it and have it to cure hiccups, suggests Naini. Mint or pudina is known to ease symptoms of the irritable bowel syndrome. It is also known to have anti-fungal and anti-bacterial properties. Mint oil when rubbed on your forehead soothes headaches too. Mint paste while applied on pimples and acne can cure it.